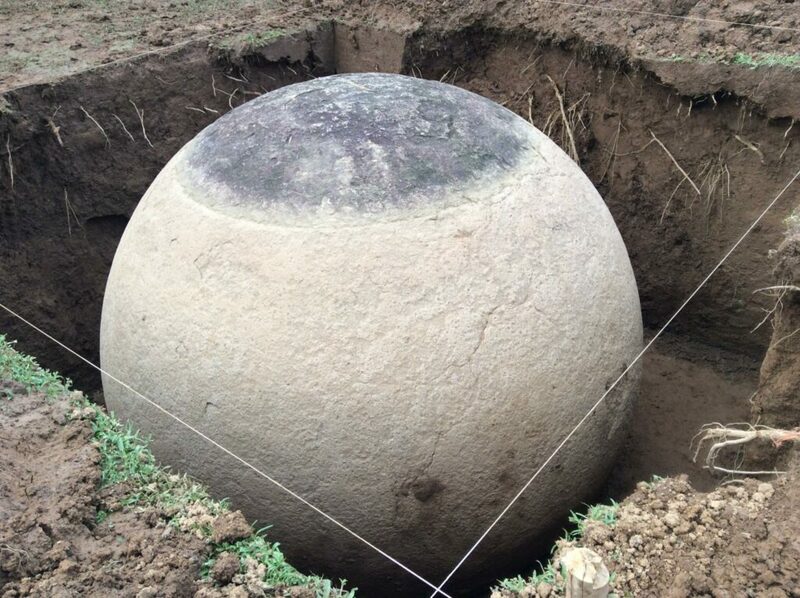 Excavations in Costa Rica have revealed a massive—nearly perfect—stone sphere, prompting experts to ask how such precision was achieved thousands of years ago. “We have studied the terrain in which there are more than 15 of these spheres, and some are placed beside areas that give access to residential buildings as if they were placed there to welcome you. They were used as a sign of hierarchy, rank and ethnic distinction, “explains archaeologist Francisco Corrales of the National Museum of Costa Rica. The massive stone spheres are referred to as the stone spheres of Diquis, a region to the south of Costa Rica, and were made between the year 300 and 1500 AD by the predecessors of the Boruca Culture, explains a post on the Facebook post on the National Museum of Costa Rica. These massive spheres were located within important settlements, forming sets or alignments and as part of principal architectural structures, to reinforce the prestige of a place and the position of power of the leaders. The great quantity of these sculptures, the fine finish of their surface, their nearly perfect sphericity, the variety of sizes, as well as the manufacturing process, symbolism, and use in public spaces making them exceptional archaeological artifacts, explains the Diquis website. “It’s an incredible opportunity to study these unique elements in the world and in particular the five partially buried spheres located in the archaeological zone Finca 6,” says Mexican archaeologist and researcher Isabel Medina. 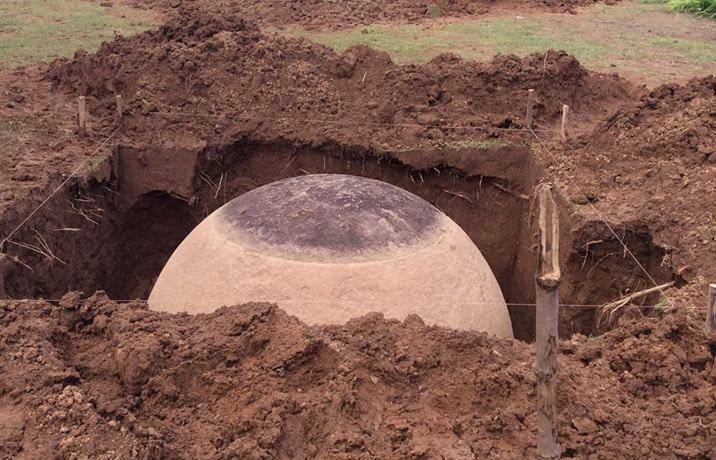 According to Medina, the decision to maintain the half-buried spheres “has been adequate for its in situ conservation and its subsequent study,” which is already being carried out by a multidisciplinary team from the National Museum of Costa Rica. The production of spheres involved grinding large blocks of igneous stone, such as gabbro, granodiorite, and andesite or sedimentary stones such as limestone and sandstone. The process involved chopping the surface with stone tools, the ancients used heat as it allowed the removal of extra layers of rock and with the help of wooden tools, it was possible to control their roundness. The surface was treated with abrasives as sand to match and the larger spheres were also polished to give them luster or gloss. There are spheres of a few centimeters up to 2.66 meters in diameter and they can weigh as much as 25 tons. The raw material for their creation is located in the foothills of the Cordillera Costeña. From there, the material or the semi-finished sculpture was moved to the site where the sphere would be located and was finished there. It is unknown how the ancients transported the stones, but it was a complex work, which involved a great organization, mobilization of people, the use of levers and bearing bases. Regrettalby, most of the spheres were removed from their original site, which means valuable information about their origin and use is currently missing. The observation of the isolated object, without the social context of which it was part, has generated a series of myths and speculations without scientific basis. By underestimating pre-Columbian cultures, some consider how aliens created them, while others see in their incdredible shpae traces of the mythical Atlantis, navigational devices, doors between temporal dimensions and containers of esoteric energy. Take your pick. Anthropologists Ivar Zapp and George Erikson assert that the spheres are proof that in the delta of the Diquis, a once great civilization settled down near the sea. In their work, the Atlantis in America they argue that the petroespheres indicated marine routes, and were used as navigational instruments, and that their alignments pointed towards megalithic sites like the Columns of Hercules (Gibraltar), the pyramids of Egypt, Stonehenge, or Easter Island, suggesting that Atlanteans were related to other civilizations, and evidence of their exsitnece is present in Costa Rica.